Figure 1. 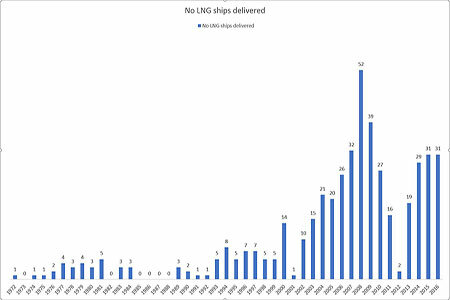 LNG Vessels delivered, based on delivery year. To help the different players in this changing market, Kyma AS have developed a tool to monitor and report the performance of the vessels against the terms defined in the charter party or the spot market. This article aims to present the benefits of using real time data from the vessels with a high sampling frequency (big data) to continuously monitor the performance of the vessel. The high frequency and volume of the collected data makes it possible to perform very accurate analysis on the given data and possibly act proactively to optimise the performance. The web based Kyma online system includes an optional module, called the Charter Party Module (CP Module), to monitor and benchmark the performance against the terms given in a charter party contract. The CP Module uses the high frequency performance data collected on board the vessel for a continuous and detailed analysis and evaluation of how the vessel performs against the commercial conditions. Figure 2. CP module plot. The charter party normally includes a benchmark curve that states the guaranteed maximum fuel consumption vs the different vessel speeds. 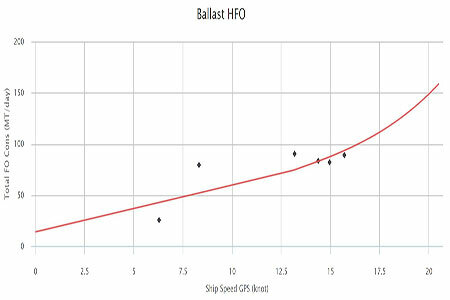 A normal example for both ballast and laden condition can be seen in Table 1. These curves are fed into the CP module to establish the benchmark curve. The exclusion filters given by the CP can be set in the module either by a specific threshold value of one or more available parameters – for example, exclude data with mean draft higher than 10 m (only ballast condition is analysed), wind force above BF (X), or ship speed below (X) knots, etc. When combinations of filters are used, the logical operators ‘and/or’ will control how the result will be presented. The exclusion filters can also be set as specific time periods. The result of the analysis in the CP module is shown as a day-to-day plot of the individual valid points (average value of valid data per day). A corresponding summary table gives the same results as numeric values. The difference between actual consumption and allowed consumption is calculated continuously, where a positive number means that the vessel has used (X) t more than guaranteed by the CP, which normally means that the charterer is compensated for this extra fuel consumption. To show how the CP module works, a simulated voyage has been prepared with a LNG carrier on a ballast voyage between Dahej, India, and Ras Laffan, Qatar. The intention with this case study is to show that the automatic logging of data into the CP module can be used to calculate with a high accuracy the performance of the vessel against the charter conditions. 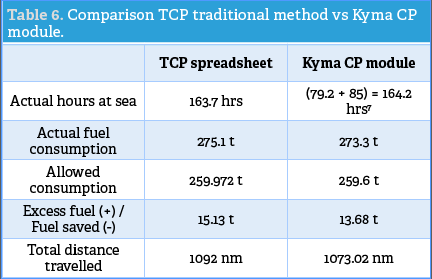 The traditional method to settle a Time Charter Party (TCP) is to look at the historic data after the voyage is finished and then calculate an actual average speed and actual fuel consumption (minus any exclusion periods). 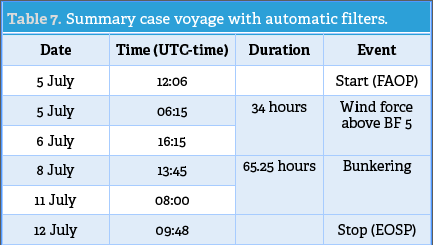 Table 2 shows a summary of the logbook remarks for the selected voyage. Table 3 is a summary of the recorded and calculated voyage data based on the traditional method. In particular it shows 15.13 t of excess fuel compared against the charter party reference baseline. The same voyage and time settings were also inserted into the CP module. The filters (exclusion periods) were set according to the same time periods as given in the logbook. 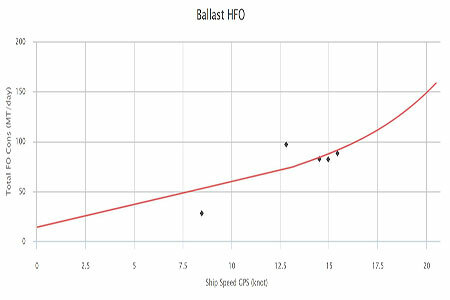 The plot in Figure 3 shows the points for the average daily fuel consumption per day (tpd) against average vessel speed (knots). The red line is the TCP benchmark curve. The corresponding summary table for each valid point plotted can be seen in Table 4. The excluded time can be seen as a summary in the right column in the table. And finally, to calculate the overall difference in fuel consumption against the chartered benchmark curve, it is necessary to calculate this separately, and present the data in a new table (Table 5). Based on the TCP spreadsheet, using the traditional method and the results from the Kyma CP module, the corresponding results displayed in Table 6 are produced. In Table 6, the data from the spreadsheet and the onboard logging system show a very good correlation. The total t of excess fuel calculated by the CP module is 13.68 t. The difference in excess fuel can be explained by the fact that the Kyma CP module monitors the online data continuously (every 15 seconds), and calculates the deviation from the baseline. 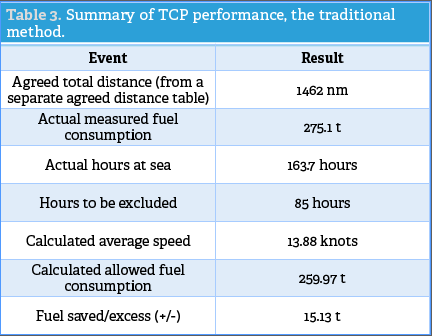 The TCP method calculates the result based on the total historic fuel consumption and vessel distance. 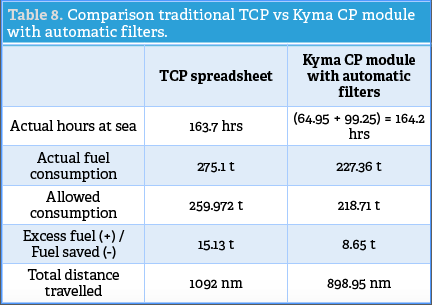 When the CP module is set with automatic filtering, Kyma used the settings of excluding data when the wind force is above Beaufort Scale 5 or when the vessel speed is below 5 knots. When these criteria are used to calculate the exclusion period, the exclusion period seems to be much larger. The master noted in the logbook that the exclusion period for wind force above BF 5 was about 20 hours, but in reality the wind was above BF 5 for about 34 hours according to the anemometer recordings. Obviously, the same start and stop have been used, but the exclusion period is significantly larger than the masters logbook (as seen in Table 7). Figure 3 shows the new plot with the valid points when automatic filters were applied. Figure 3. Charter party plot, automatic filters. If you compare the results of the automatic filter settings against the traditional method, you can see in Table 8 that the actual results are somewhat different. Table 8 shows that the longer exclusion period recorded with the automatic filters implemented was caused by the accurate recording of the wind. The Kyma Ship Performance (KSP) system recorded a wind force above BF 5 for 34 hours. It is of course very difficult for the Captain to continuously monitor the wind force with precision. 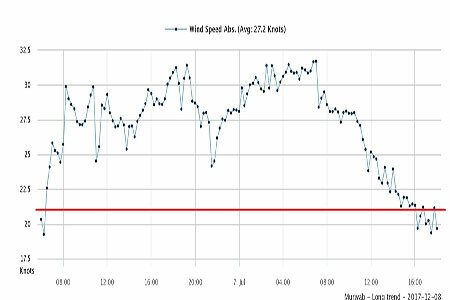 The automatic logging provides a much more accurate result, and in this case the measured wind force was stable above the 21 knots limit for up to 34 hours. Figure 4 shows the recorded data of the actual wind speed. Figure 4. Wind force during exclusion period (- limit). The automatic filtering show that the vessel used 8.65 t of excess fuel compared against the charter party reference baseline. The total fuel oil consumption recorded by the KSP for this voyage with time filters is 273 t. The total fuel oil consumption recorded by the crew is 275 t. This shows quite a good correlation. The total distance in the KSP is calculated based on the recorded vessel speed. The total distance calculated by the KSP is 1073 nm and the corresponding distance in the logbook is 1092 nm. This is also considered to be within the expected accuracy. It is possible to use automatic filters for logging the CP parameters, but as the case study shows this gives sometimes different results, since automatic logging is a much more accurate method. Time will tell if automatic filtering will be used in the actual settlement of charter parties, but this case study shows that the automatic filtering is much more accurate, and as such would be a much more preferred method to use than the manual recordings which is used today. The automatic filters can certainly be used as a powerful tool to analyse the data and give valuable knowledge on how to optimise the performance. The wind conditions are observed/recorded different between automatic logging and visual observation. The current case study of a specific voyage shows that the automatic logged data can be used as an alternative to the traditional method, and in some cases the automatic logging can give a much more accurate result than a manual method can provide. It is also possible with the logged data to get a day-to-day overview of the vessels status against the fuel consumption benchmark, and it will therefore be possible to adjust the fuel consumption during the voyage to give a better end result. In conclusion, with the Kyma CP module it is possible to have a much closer day-to-day control of the performance against a charter party. Charter Party (CP) – A transport contract between shipowner and shipper of goods. Time Charter Party (TCP) – An arrangement whereby a shipowner places a crewed ship at a charterer’s disposal for a certain period. Freight is customarily paid periodically in advance. The charterer also pays for bunker, port, and canal charges. Spot market – Short term contracts for voyage, trip, or short-term time charters, normally no longer than three months in duration. Gas Strategies, 2017, “LNG Outlook 2017: Surplus or balance? The master clock was adjusted back one hour, and then later ahead 1.5 hours. The total time according to the KSP is therefore calculated to be 164.2 hours (Net + 0.5 hours extra).